One challenge with LEDs is the mounting of the displays. 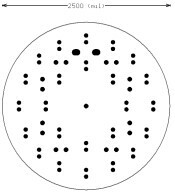 We produce several innovative solutions, including the LED SpotLight, which holds 24 LEDs in a circular pattern on a compact 2 3/8" (60mm) diameter jet-black board. The 24 LEDs are wired in sets of three, with each set having its own current limiting resistor. 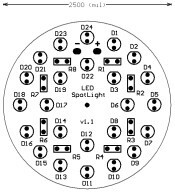 A full 24 LEDs running on the board will draw a total of approximately 160mA. Construction of the LED SpotLight is extremely simple and can be completed by the novice builder in less than 45 minutes requiring only minimal soldering skills. With twenty four LEDs and eight resistors, this system is likely to be one the simplest and most satisfying kits you will ever construct. A complete instruction manual. 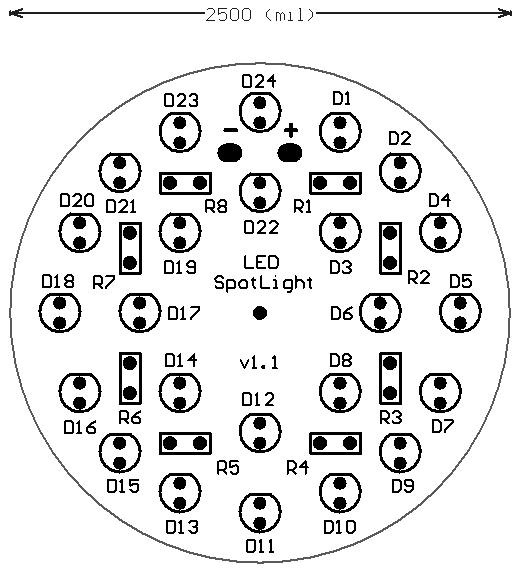 construction guide and schematics for the LED SpotLight is available for download. 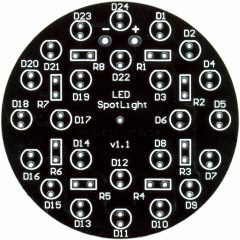 The LED SpotLight is a fairly simple design PCB, and can be hand-crafted by those who wish to etch their own boards at home. 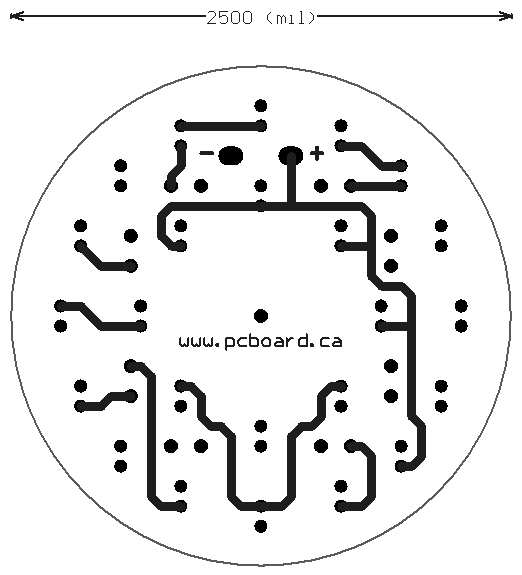 To assist in your creation, we are including four images in PNG format of the board layout which you can transfer to your own PCB material. 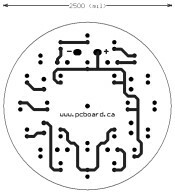 The four images include an overview of the PCB for component layout, a board-top image of the traces, a board-bottom image of the traces and a final image of a drilling guide. These are all provided for your own enjoyment and no support is provided for these. 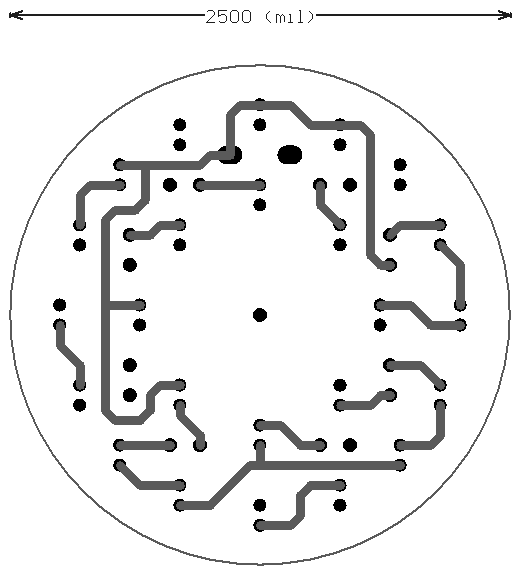 Shows placement of the components & connections. 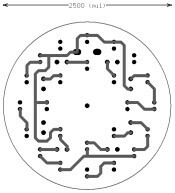 Shows placement of tracks on solder side of the PCB. 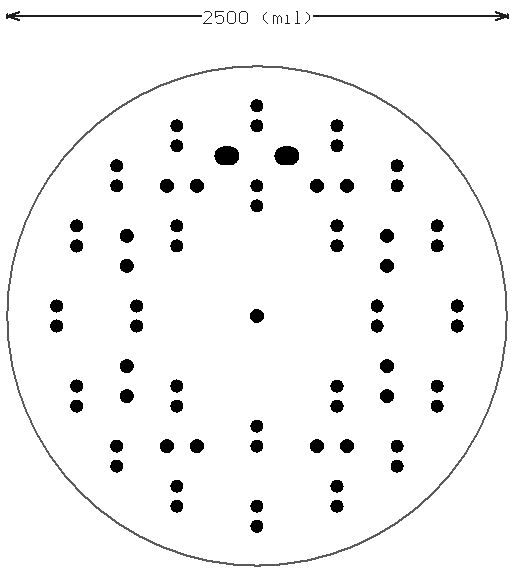 Shows drilling guide of all holes on the PCB.